InnovationMain - Creativity And Innovation Driving Business delivers engaging online workshops to jumpstart innovation at your business. Learn how top innovators in the world innovate, change and grow their business successfully, especially during economic cycles. The Innovation Bootcamp workshops will INSPIRE you to unlock your creativity, spark new ideas, uncover and create game-changing innovations, and accelerate your business. Attend the Innovation Bootcamp workshops live, online or on-demand. Learn 100+ pertinent strategies and tools, hands-on techniques and uncommon insights to unleash creativity and innovation at your business! Become Innovators at your Organization. Unleash Team Creativity and Spark Ideas. Launch New Innovations with Processes. Provide Tools to build Innovation Factory. Accelerate and Grow your Business. Ten Traits of Creative Leaders - Are you an innovative leader? 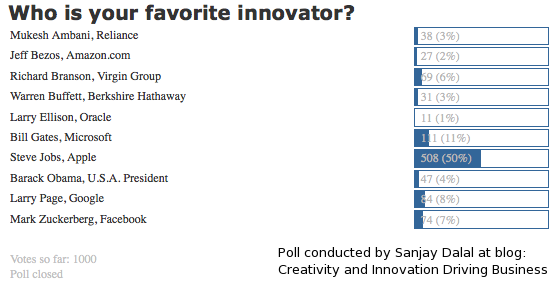 Apple - What makes Apple the #1 Innovative Company? 1. Unleash over 100 real strategies, tools, and techniques to jump start innovation at your organization. 2. Prepare you and your team to convert ideas and creativity into successful innovations. 3. Make innovation a strategic business driver providing sustainable competitive advantage. 4. Enable you to accelerate and grow your innovation portfolio profitably. Who should register for Innovation Bootcamp? Why should my team attend? Challenge your mind. Think different aka outside the box. Be innovative. Unlock your creativity. Create and generate new ideas. Convert ideas into successful innovations. Become an innovator and entrepreneur. Build an Innovation Factory. Accelerate and grow your business. We guarantee that you will be inspired and ready after attending the Innovation Bootcamp to jumpstart new innovations at your business. Register Today for the online Innovation Bootcamp. Registration is limited to 5 attendees per bootcamp. The Innovation Bootcamp is delivered through Web seminars in an interactive format! You only need a computer to engage, interact and collaborate, at home or at your office! It's that simple...The Innovation Bootcamp consists of online interactive workshops. Live workshop begins with an interactive quiz, collaborative brainstorm and ends with a Q&A. Our live workshop webinars are limited to only 5 attendees per bootcamp to facilitate maximum interaction and collaboration. The on-demand workshops include on-demand quiz, brainstorm through e-mail and Q&A with presenter anytime through e-mail. Live, online Innovation Bootcamp is available to attendees over two days from 8:30 am to 12 pm (attendance is required for both days). It is recommended that 5 people register simultaneously from your organization. We will make every attempt to schedule your Bootcamp within two weeks. The Innovation Bootcamp only costs $1,499 for up to five members on your team. This includes live, online training for your team with a Top Innovator in the nation, Business Innovation eBook used by over 1,000 leading organizations, and pertinent presentation training materials to immediately help you innovate at work (additional $199 value per attendee), and a paid subscription to our Business Innovation reports for one year for every team member (a $120 value per attendee). You only need a computer with sound card to attend the live, online workshops from your office or home. It is convenient, flexible and effective. Contact Us today if you would like us to schedule an online Innovation Bootcamp (recommend 5 people), or deliver the Innovation Bootcamp at your organization (in person) at a convenient time (recommend team of 10 or more people). InnovationMain is honored to partner with University of California, Irvine, The Paul Merage School of Business (Top 20 Business school) towards offering the accelerated Innovation Bootcamp as part of the Strategic Innovation Class (for executive MBA program). The complete Innovation Bootcamp presentation and handouts (for all six workshop sessions) containing over 400 presentation slides to spark new ideas, channel team creativity and create innovation factory.